For many, the first thing that comes to mind when Vietnamese food is brought up is probably “Pho”. In general, it’s on the lower-scale of the food chain. It’s comfort/fast-food. 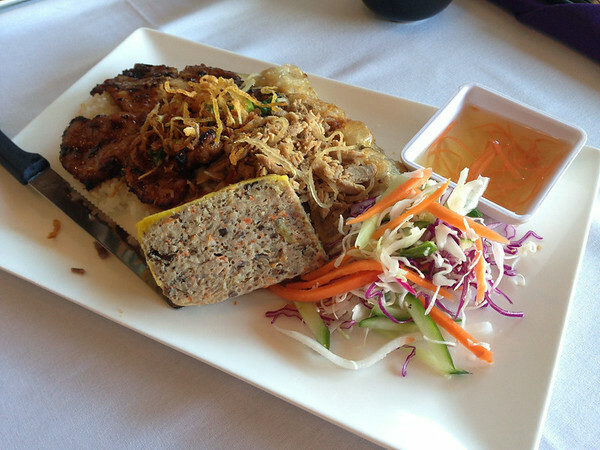 There is, however, more to Vietnamese than just Pho. This is “Broken Rice”. Ironically, the term broken rice (com tam) is traditionally eaten by the Vietnamese working class and is known to be cheaper to consume. 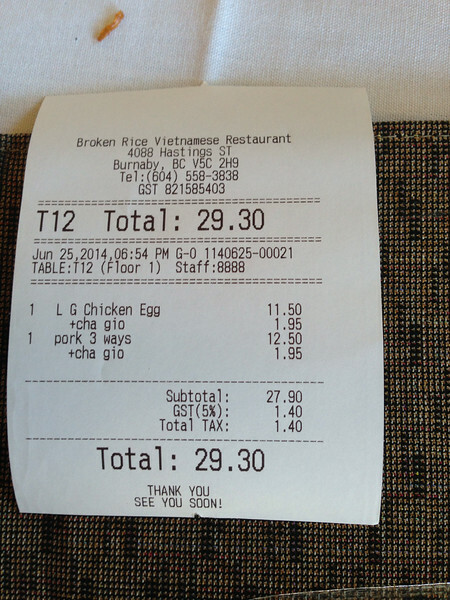 However, “Broken Rice” on Hastings is not your typical cheap pho joint. In fact, it’s upper scale and blends right in with the Burnaby Heights area. 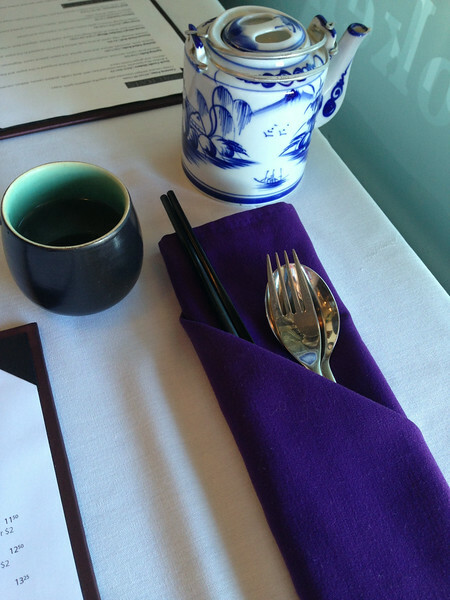 The restaurant offers a wide range of contemporary approaches to Vietnamese food. My girlfriend and I walked in for an early dinner. It was a weekday and there wasn’t a lot of people. 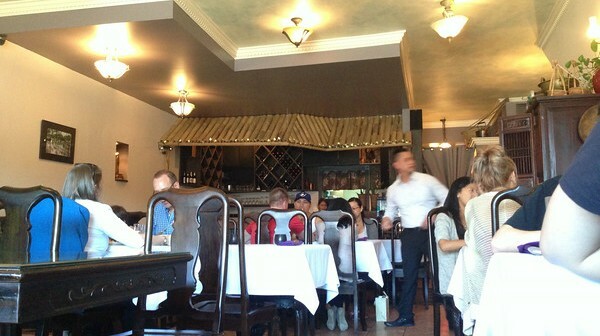 The patio windows were open, overlooking the busy Hastings street. The tables were well-set and the light blue sky of the restaurant’s ceiling just made it a very breezy setting to be in. I think this was one of the hardest decisions ordering in Vietnamese restaurant because their menu items are much different than a regular Pho joint. After studying the menu (for not too long), we decided to try their “broken rice”. It was very well presented. The plate was pork three ways, a grilled pork chop, shredded pork and minced pork loaf on broken rice served a side salad and a spring roll (for +$2). I thought everything was delicious and flavourful. my favourite would be the pork loaf. It’s truly a Viet delicacy because they don’t have this at every Viet restaurant in the Lower Mainland. The spring roll was also a nice edition and well worth it. 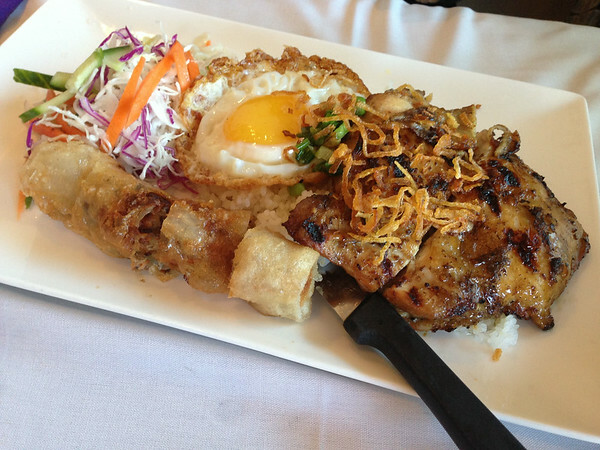 My girlfriend had the grilled lemongrass marinated chicken with a fried egg on broken rice, a side of greens and a spring roll. When it arrived to our table, the first thing I noticed was the egg. It was perfect, runny yolk and brown-fried egg whites. The chicken was a little disappointing because it had no lemongrass flavour at all. It was purely a grilled chicken. I’m thinking they didn’t marinate it enough. Overall, I liked the offering they have here at Broken Rice. There’s a few more adventurous dishes I would like to try next time, but as for the original plates, I think they did a pretty good job. It was a little more expensive than your typical Pho joints, but given the ambiance, the service and the presentation, I personally think it was worth the extra dollar or two. I’ve seen a few people get the “Sizzling Saigon Crepe” will definitely have to try it next time. There aren’t really much parking along Hastings, so prepare to parallel park on the streets.